Richard Dormer stars in a reverse-told serial killer story that shows why this format can be thrilling — and why it almost never works. It’s impossible to talk about “Rellik,” the new detective series from Cinemax, without diving into how it’s told. Moving backwards from the end of a serial killer investigation and told in reverse order, there’s an immediate sense that this is not like other shows. Even unlike “American Crime Story: The Assassination of Gianni Versace,” which kept entire episodes moving forward as it gradually worked its way back through a murder-filled timeline, “Rellik” is a sequence of scenes and interactions that hop back in time in a half-dozen ways every chapter. The one benefit that this structure offers “Rellik” is the ability to put the audience in a detective’s mindset more explicitly than any other detective show. As DCI Gabriel Markham (Richard Dormer) wades through the oppressively dark waters of a string of murders and acid attacks, “Rellik” leaves it to the viewer to hunt for clues within each line of dialogue and each passing new venue. Working backwards, the information at the “end” of this story is still its own disorienting beginning. (To use a comparison in line with the subject matter, imagine the series like a context-free file folder of information given to an officer transferring in from another precinct.) Red herrings and surprise twists still abound, even as the show follows the lead-up to events we’ve already seen. It’s a distinct way to tell a story. It’s also a massive risk. The fourth time you see droplets of rain reverse course and move up into the sky rather than down, it is hard to escape how hard the show is working to be different. At the beginning of the series, Markham’s face is heavily scarred, the result of him being attacked as well. When it becomes clear that the show is working to answer that mystery as well, it’s just one instance of waiting for a character to encounter something horrific, knowing full well what happens in its aftermath. It also cannot be overstated how oppressively dark this show is. 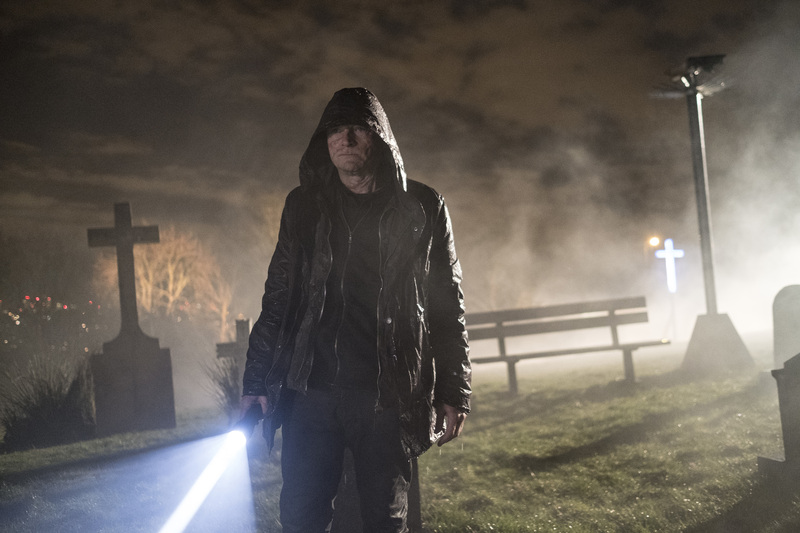 British crime dramas have never been ones to skimp on violence and psychological terror, and “Rellik” certainly does not pull its punches either. In many ways, the brutal preferred method for the serial killer — dousing victims with hydrochloric acid and removing all identifying features — is somehow the least unsettling thing in a few of these episodes. The way that the show puts doubt in the minds of its audience as to who or why these killings happened only fortifies the idea of a grim view of human nature. When viewers are never sure who’s responsible for the series’ body count, the dots connecting what’s happening eventually lead to some horrifying conclusions. Writer/Creators Harry and Jack Williams, who played before with genre expectations and the limits of human decency in “Liar” and “The Missing,” spare no narrative expense in making a story that can survive being told backwards. Some of the turns in this story are legitimately upsetting and truly unexpected. But when gathered in total, the sheer volume of sensational events that combine to form the framework of these six hours results in a self-contained saga where every gap needs to be filled by something extraordinary. Given the ways that these characters are connected, the show also has to be very restrictive in the number of outside characters brought in the story. Over time, a cog in the mechanism keeping this show hurtling backwards through space. That no-character-wasted approach is often a sign of a show going one of two ways: nuanced character study or a collection of puzzle pieces. Try as “Rellik” might to give some of the side characters a full-fledged story, there’s an inevitability that each new character with a speaking part beyond Markham’s colleague Elaine Shepard (Jodi Balfour) is little more than a means to an end. Over time, it’s easy to skip over these reverse introductions — it’s difficult to balance out the ability to appreciate any subtle character work while also trying to suss out the context for all of these interactions. “Rellik” is delayed-action story unlocking that makes for a narrative experience that really does depends on the individual viewer, which at times is fascinating to see in its execution. But there’s a reason why stories aren’t usually told this way. That stalled gratification, by its nature, feels wholly manipulative in a way that borders on being disingenuous. As the story progresses and some vital information never addressed previously becomes the biggest key to unlocking what is actually happening, the line between selective inclusion of detail and Deus Ex Twistina often gets muddled. As a victim of an acid attack himself, Markham is one of the only characters that the audience can effectively rule out as the man responsible for these deaths. Even as we see his relationship with his family deteriorate and his vices come into stronger focus, Markham’s life is the straight line along which the show traces its story back. The show’s greatest asset then, is Dormer, who gives Markham an enigmatic, unquantifiable charm even under all of the scars. Dormer’s smile becomes one of the show’s key weapons. As with past Dormer characters, those smiles sometimes are meant to mask emotion, provide reassurance, or express a certain level of disdain. Caught in the middle of a nasty web of dead bodies and broken psyches, Markham sometimes has to convey all of those ideas within a single moment, much less an entire scene. The revolving door of suspects that pop up with each passing episode give this show something of a procedural feel, even as we’re meant to unpack the full arc. Working back from the victims themselves, each potential new killer gives this show a reverse “Columbo” (“Obmuloc”…?) feel. Instead of knowing who did it and asking why, “Rellik” starts with a crime and builds its surprises by recontextualizing those motivations. In the process, “Rellik” tosses in some of the obligatory philosophical musings that always seem to come with shows about killers. A handful of extensive discussions of what makes a person do what they do seem placed at points to break up the nonstop extremes of each of these reverse-moving plot points. Toss in the germaphobic tendencies of the story’s central psychiatrist (the perpetually underutilized Paterson Joseph), a sequence for the sake of protecting spoilers we’ll call “To Live and Die in London,” and a bevy of endangered children, and it’s a show that works too hard to compensate for the potential disadvantages its storytelling setup brings. Credit “Rellik” at least for this: in a world that is rewarding and in a lot of ways encouraging passive consumption of entertainment, this is one puzzle show that does not work if you are not actively engaged in looking for answers along with Markham. “Rellik” may not be the perfect murder, but it’s one that as it unfolds, is worth at least keeping an eye on. “Rellik” airs Friday nights at 10 p.m. on Cinemax.